Eastern Subterranean Termites are the most common termite found in North America and are the most economically important wood destroying insect in the United States. An average colony consists of 60,000 to 20,00 individuals, but colonies numbering in the millions are possible. All termites are social insects that live in large colonies functioning together to support the needs of the colony. Colonies are comprised of three cases: reproductives, soldiers, and workers who do the work of the colony. The colony is usually located in the soil, workers use the soil to build tunnels to reach structural wood upon which they feed. 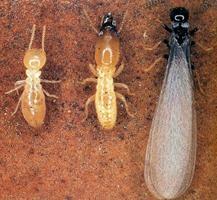 Termite digest wood with the help of special organisms in their digestive system. Color: winged reproductives are dark brown to almost black, solder bodies are cream colored with light brown rectangular heads, workers are cream colored. Region: From Ontario southward and from the eastern United States seaboard as far as west as Mexico, Arizona, and Utah. Habits: Worker termites seem to prefer fungus infected wood to feed on but will feed on sound wood as well. Threats: Subterranean termite are a very serious threat to structures and should not be ignored. Prevention is always the best option when dealing with the destructive pests, waiting to treat until they infest is a costly mistake. Repairing the damage caused by termites will often costs more than the protective service.